Vinyl Drawstring Bag. 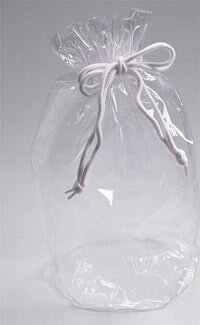 Crystal clear and oh so pretty when used for wrapping up products for customer gift packs. 9X12 - $2.00 each. These make great travel bags for toiletries, hair products, makeup, etc. and you can easily see what is inside because the bag is clear! Comments: The ladies at our church use this bag to put together needed toiletries and other items for women who are in crisis at the Alliance Against Family Violence and Sexual Assault. We also make these bags for women participating in a halfway program. The bag allows us to nicely package up needed items with a few fun things included as well. The women love them because they can use them to carry their items back and forth to the restroom. Comments: This bag is great and can be used for so many different things. We use them to make emergency hygiene kits for the Alliance Against Family Violence. We fill them full of toiletries and donate them.